Early this morning we received a sat message confirming a downward trend in flows on the S Fk Flathead. Very exciting! We are wondering if we are the first crew of boaters here this season. We dropped our boats into Danaher Creek just below its confluence with Camp Creek late this morning and proceeded to enjoy what May have been my favorite Danaher float yet. With only 3 portages (one very long one! ), lots of water, and plenty of splash and technical maneuvering made it both interesting and delightful. We reached the confluence of Danaher and Young’s Creek (Mile 0 of the S Fk Flathead) with the intention of camping there. After deciding that this was sort of a Motel 6 of wilderness campsites (tucked in a tiny tree stand amongst a giant burn) we opted instead to continue down the S Fk Flathead to Big Prairie for something a bit more upscale, in spite of the fact that late afternoon was rapidly transitioning into evening. But weather was good and we were confident, so we paddled on. With the S Fk clipping along at 5+ miles an hour we’d be at the Waldorf soon. Then came logjam. After logjam. After logjam. And more. All those came with portages through thick willow, mud, and flooded grassland. The well known logjam that protects the entrance to upper Big Prairie has been transformed into multiple river channels choked with wood at high water. Discouragement turned quickly to an intentional focus on our daily mission and we began to appreciate the character of each portage and exit eddy. 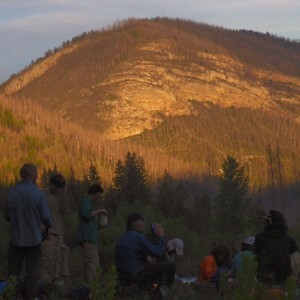 So more than two hours later as the sun began to set behind the western ridges protecting the S Fk, we arrived at a five star camp where we enjoyed an outrageously good chicken fajita meal from Mountain House, and a big fire to keep the skeeters at bay while watching the alpenglow on Flatiron Mountain in hi-def (photo). We are camped in a stream side meadow with 180 degree views framed by the Wild and Scenic South Fork of the Flathead River. Our Crew of Venturing Scouts is proving themselves expedition worthy. The 27 miles that we’ve traveled to reach this point have been hard earned, and they’re rapidly entering that glorious cooperative characterized by what we call “Expedition Behavior”. They’ll need it for next 80 or so miles remaining. We hope to camp at the White River confluence tomorrow.